So one of your New Year’s Resolutions is to be a better citizen, right? With the advent of the internet, luckily for us, making your opinion known and voice count has never been easier. Today’s mission is to Ban Toxic BPA in Food Packaging. NY Senators Kirsten Gillibrand and Chuck Schumer announced their introduction of the BPA-Free Kids Act to protect children and pregnant women from this chemical. Back in November Consumer Reports released a study showing BPA (bisphenol A) present in canned goods. Aaaaaiiiiieeee. The bill, The BPA-Free Kids Act, will prohibit the manufacture and sale of food and beverage containers composed of BPA for infants and toddlers, like baby formula cans. 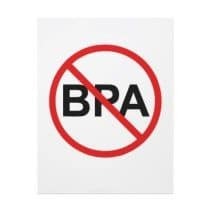 Children’s foods and beverages made of BPA would be labeled “banned hazardous substances” under the Federal Hazardous Substances Act. The bill mandates application of criminal or civil penalties for any violations of the BPA-Free Kids Act, including the testing, certification, and labeling requirements. Thank you Senators Gillibrand and Schumer. NOW, let’s show our support. Become a “citizen co-sponsor” of the bill and express your support. I just did it and it took less than 30 seconds. Done and DONE. Thanks for sharing this.